Romantic Cinematic Jazz Bossa. "Great feel! 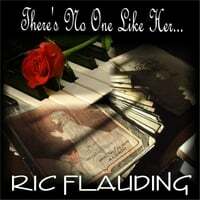 It's like Adele with a lite jazz overtone". Romantic Cinematic Jazz Bossa featuring piano and ensemble. Composed by Ric Flauding. Sam Levine: Tenor Sax. Denise Flauding: Cover Art. REVIEWS: "Great feel! It's like Adele with a lite jazz overtone". / "One of the best love songs of the decade".